Defining a SELECT query within another query is called nested query. A Subquery also called INNER QUERY / INNER SELECT / SUB-SELECT. The Parent-query i.e, outer-query can be any DML statement but child-query(sub-query) must be only SELECT-statement. For example, an UPDATE statement or INSERT-statement or DELETE-statement can contain SELECT-statement, but reverse is not possible. You can write sub-query in SELECT-clause, FROM-clause and WHERE clause. Defining sub-query followed by SELECT and FROM clauses is said to be in-line view. Hence, there are 3 types of sub-queries. A view created by using sub-query cannot be updated. If sub-query returns single value, then you can compare it with comparison operator. Otherwise (returning multiple values) use ANY, SOME, ALL, IN. The COMPUTE, ORDER BY and INTO clauses cannot be specified in sub-query. The ntext, text, and image type columns cannot be included into the subqueries. A Sub-query generated view is cannot be Updated. A Sub-query cannot includes the columns of type: NTEXT, TEXT, and IMAGE. Getting Max and Min salaries of employees simultaneously. Find how meny employess are there those salary is less than maximum salary. Simple in-line view ( Creating a derived table). In-line view with JOIN operation. Finding the employee who is getting Maximum salary using JOIN. Find whether or not two columns of a table are equal. Step-1: In the In-line view compare the two columns of the table(s) returns true or false. Step-2: If you get all ‘true’ then the columns are equal otherwise un-equal. If Sub-query returns single value, then you can compare it with =, !=, <. <= etc. But when sub-query returns multiple values, use SOME, ANY, ALL, IN operators to perform comparisons. Finding Maximum of salary without using MAX() function. Multiple levels of Nested queries is possible. First Outer query executes and submit values to the inner query. Then, Inner query executes by using value returned by outer-query. The condition applied on outer query checked. 1 MainQuery : N Sub-query : 1 Main query Condition.. M times. Co-related sub-query loop under main-query; whereas normal sub-query; therefore correlated Subquery executes on each iteration of main query. Whereas in case of Nested-query; Subquery executes first then outer query executes next. Hence, the maximum no. of executes are NXM for correlated subquery and N+M for subquery. Correlated uses feedback from outer query for execution whereas Nested Subquery provides feedback to Outerquery for execution. 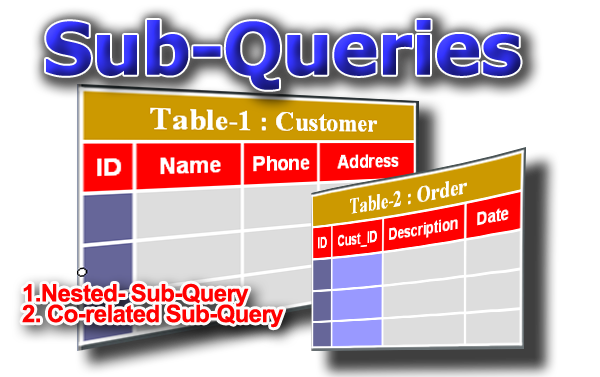 Hence, Correlated Subquery depends on outer query whereas Nested Sub-query does not. Using Co-related sub-query performance decreases, since, it performs NXM iterations instead of N+M iterations. ¨ Co-related Sub-query Execution. Thanks for sharing this nice blog..Its really useful information.. Thanks for sharing this nice information with us.It is really very nice blog..
Microsoft ASP.NET Training in Delhi- A good professional need to update regularly as per trend of market, to keep their skill sets update and industry relevant. To keep up updated with the changing requirements of the IT Industry, RKM IT Institute helps to BCA, MCA, BE, B. Tech and other IT students for their Industrial live Project Training. RKM IT Institute is providing Live Projects Training on .Net, Java, PHP, SQL Server and Oracle technologies. RKM IT Institute provides 6 month project based training and 6 week summer training projects. i wondered keep share this sites .if anyone wants realtime training Greens technolog chennai in Adyar visit this blog.. Very well explained. Easy to understand. Corporate Training teaches you basic concepts of relational databases and the SQL programming language. Thanks for writing this in-depth post. You covered every angle. The great thing is you can reference different parts Gexton Education . Thank you for sharing this blog.good information.Dot net Institute In Hyderabad! Best Dot net Institute In ameerpet! Dot net Certification In ameerpet! Awesome article. It is so detailed and well formatted that i enjoyed reading it as well as get some new information too..
Super Indeed A Great Article Thanks for Posting and Sharing Very Useful and helpful Urgent Care Services Provided by Us.I just Want to share this blog with my friends and family.A worthy blog...Keep On posting New posts,I Will follow this blog regularly.. Thanks for sharing such a useful information. Nice blog..
Nice blog. Explained well. I have suggested to my friends to go through this blog. Very nice explanation. Thank you for sharing this useful information. The information you provided in the article is useful and beneficial US Medical Residency Really Thankful For the blogger providing such a great information. Thank you. Have a Nice Day. Dot net training in Hyderabad! I recently completed this course at ExcelR. I found this course very demanding. I learned a lot in this course. I was particularly impressed with the trainers which is the best feature of ExcelR. There is a wide breadth of topics covered in a short period of time. Love ExcelR. Hi, I have read your blog and I gathered some needful information from this blog. Thanks for sharing. Keep updating your blog. Such an usefull and informative blog providing such an valuable and the important info JNTU 99 .Keep on sharing such an useful and informative stuff. Fantastic blog!! with loads and loads of latest info.Thanks for sharing. I am really happy with your blog because your article is very unique and powerful for new reader. Its a wonderful post and very helpful, thanks for all this information. We shared official lucky patcher apk download link for your guys.